Gezhou Dam, located in the entrance of the Xiling Gorge and 3 kilometers down low the Nanjing Pass in the Yichang city of Hubei province and 38 kilometers away from the Three Gorges in this upstream, is the No.1 largest hydroelectric dam in China in the mainstream of the Yangtze River which plays an important role in the adjustment and channel of the Three Gorges Dam. With its length 2, 561 meters, height 70 meters and depth 30 meters, the Gezhou Dam is controlling a water volume for 55.5% of the Yangtze’s total capacity. 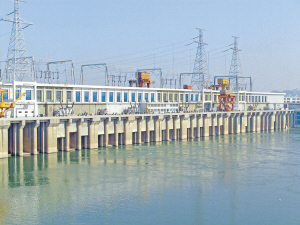 The annually average volume of the Gezhou Dam is 14.300 cubic meters per second, with the annual volume 451 billion cubic meters and the average volume of the output sand 0.53 billion tons and average volunm of sand contained 12 kilograms per cubic meter, of which 90% sand are concentrate and gathered at sprinkle water period. It is a great and enormous construction project starting at May, 1971 and completely finishing at December, 1988. The Gezhou Dam has great effect on the Yangtze River such as generating and improving the channel and other profitable influence. The generation volume of the Gezhou Dam is 2.715 million KWH, guaranteeing 0.768 KWH for its single operation and its annual generation volume is 1.57 billion KWH, while it can reach 16.1 billion KWH after the complement of the Three Gorges Dam. It output the charge to the nearby cities in the way of 500 KV and 200 KV, and output 1.2 million KWH to Shanghai, where it is 1000 kilometers away, through the 500 KV directly electronic ways, which does great help for the development of economy of Shanghai. As part of this fascinating stretch of the mighty Yangtze River, the Gezhou Dam has attracted many travelers from home and abroad to have a visit there. Standing near the magnificent floodgate, you can see massive flows of the Yangtze spill over the dam’s turbines, which create roiling torrents that roar with the sound of thunder. It is majestic and astonishing scene! Three Gorges Dam—The Biggest Hydropower Station in the World!